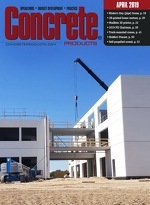 Concrete Products - Your Leading Source for Concrete Industry News From Concrete Products. Batch controls and concrete plant automation developer Marcotte Systems has entered a technology-integrating partnership with Cortex Ltd., a fleet management program and Internet of Things (IoT) device specialist. The Marcotte Control platform adjusts the required quantity of each mix constituent during batch execution, while preserving key ratios and volumetric yield. All parameters such as local material properties, density, absorption, granularity, moisture and temperature are used to smart-balance concrete mixes. The Cortex 360 solution encompasses a complete set of sensors specifically designed for ready mixed delivery and quality control—drum rotation, water-added measurement and precise auto-statusing among them. The U.S. Green Building Council, International Code Council and ASHRAE have released the 2018 International Green Construction Code (2018-IgCC), citing its potential to help state or local governments streamline code development, adoption and enforcement. The groups also envision improved industry standardization by integrating two previously separate guidance documents: ANSI/ASHRAE/USGBC/IES 189.1 – Standard for the Design of High-Performance Green Buildings Except Low Rise Residential Buildings and the ICC International Green Construction Code. Expedited by the Board of Directors, ICPI has launched a workforce development program in response to wide-spread contractor needs for new and better skilled employees. It includes a new Hardscape Installer/Contractor Career Path, in partnership with the National Concrete Masonry Association, that aligns the two groups’ certifications and education courses in a clear, achievable process for those entering the industry. New Design/Build Institute of America-backed research finds that the design-build (DB) method delivers projects faster and with greater cost and schedule performance than Construction Management at Risk (CMR) and traditional Design-Bid-Build (DBB) alternatives. Teaming with transload and aggregate supply specialist Oklahoma Construction Materials (OCM), Charah Solutions Inc. has installed fly ash silos at a rail terminal near Oklahoma City and Interstates 35 and 40 interchanges. “Our rail facility provides a cost-effective, efficient and vital link in the region’s transportation network, and we look forward to helping to serve this region’s fly ash needs for years to come,” says OCM General Manager Zac Brummal.